The Pilot Ladder and Embarkation Ladder are mandatory marine safety equipment on every ship, which are used for embarkation and disembarkation, pilot ladder is used for pilot and crew’s getting in and out the vessel in general situation, it has spreader which is different from embarkation ladder; embarkation ladder is used during the emergency situation for crews getting in and out from survival craft. Steps of ladder are made of hard wood except last 4 steps, which are made of rubber. Hand holds shall be required to ensure a safe passage from the deck on to the head of embarkation ladders and vice-versa. (a)These shall be made of hardwood, free of knots or other irregularities, smoothly machined and free from sharp edges and splinters, or of a suitable material of equivalent properties. (b)They will be provided with an efficient non-slip surface either by longitudinal grooving or by the application of an approved non-slip coating. (c)They shall be not less than 480 mm long, 115 mm wide and 25 mm in depth, excluding the non-slip surface or coating. (d)They shall be equally spaced not less than 300 mm or more than 380 mm apart and secured in such a manner that they will remain horizontal. The side ropes shall consist of two uncovered manila ropes not less than 65 mm in circumference on each side. 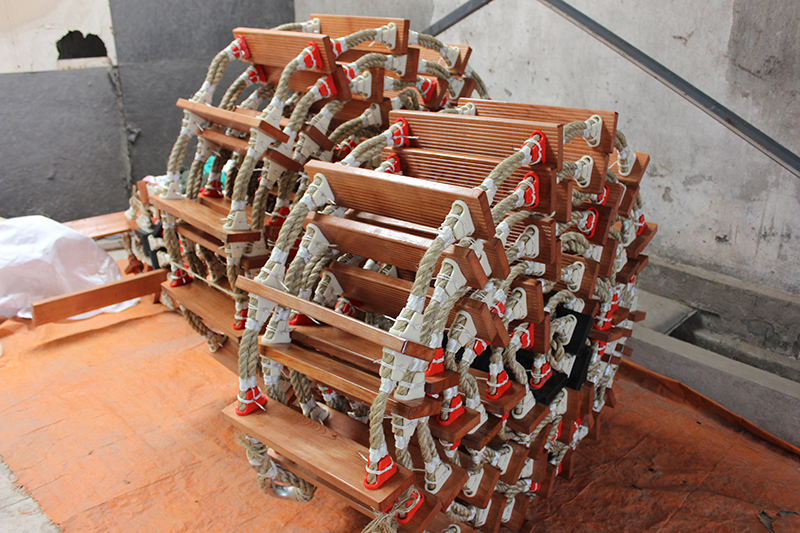 Each rope should be continuous with no joints below the top step. Other materials may be used provided the dimensions breaking strain, weathering, stretching and gripping properties are at least equivalent to those of manila rope. All rope ends shall be secured against unravelling. and other persons while a ship is arriving or leaving a port and for the disembarkation and embarkation of pilots. Every pilot ladder must be secured in a position clear of any possible discharge from the ship and so that the steps rest firmly against the ship’s side, providing the pilot convenient access to the vessel after climbing not less than 5 ft (1.5 m) nor more than 30 ft (9 m). A single length of ladder should be used, and it should be capable of reaching the water from the point of access to the ship when the ship is in the unloaded condition and in normal trim with no list. Whenever the distance to the water exceeds 30 ft (9 m), then access to the vessel must be by means of an accommodation ladder or other equally safe means. The treads of the ladder must be made of a hard wood such as ash, oak, elm or teak. Each step must be made from a piece free of knots, having a non-slip surface; and must be not less than 480 mm long, 115 mm wide and 25 mm in depth. The steps should be spaced not less than 300 mm nor more than 380 mm apart, and individually secured in such a manner that they will remain horizontal. The four lower steps may be constructed in rubber or other suitable material of sufficient strength and similar character. No pilot ladder must have more than two replacement steps secured in a different manner from the original method of securing, and these must be secured in place by the original method as soon as possible. 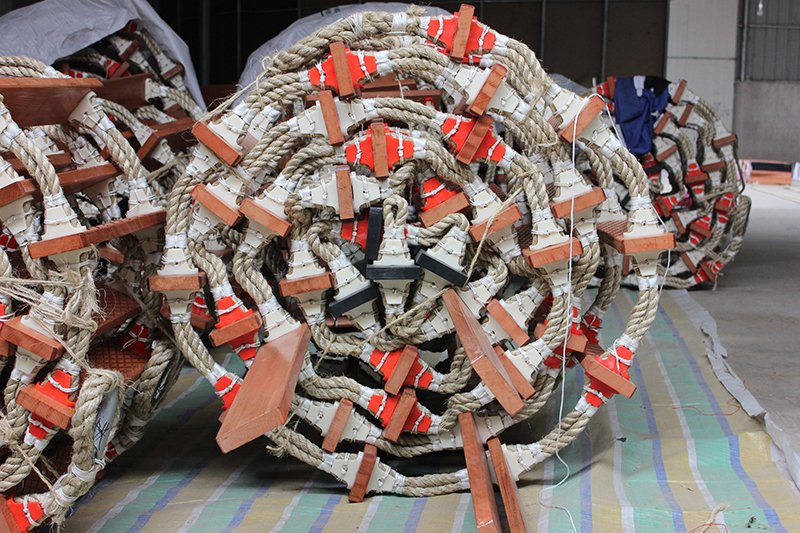 The side ropes of the ladder must consist of manila rope 18 mm in diameter. Each rope must be continuous without joins and should be left uncovered. Manropes of not less than 20 mm in diameter should be secured to the ship, and a safety line kept ready for use if required. Hard wood battens (spreaders or anti-twist battens) between 1800 and 2000 mm long must be provided at such intervals as will prevent the pilot ladder from twisting. They must be so fixed that the lowest batten comes no lower than the fifth step from the bottom, and the interval between battens must not be more than nine steps. Each batten must be made of ash, oak or similar material, free of knots. Safe access must be provided between the pilot ladder and the vessel. Gateway or hand holds are suitable safety measures. The bulwark ladder must be hooked on to the bulwark in a secure manner. It must be fitted with two handhold stanchions at the point of boarding. The stanchions should be not less than 700 mm nor more than 800 mm apart, be rigid in their construction, and extend not less than 1200 mm above the top of the bulwark. A light must be provided at night, and a lifebuoy equipped with a self-igniting light kept ready for immediate use.